Biography of Irish Genre Painter, Watercolourist and Landscape Artist. The Irish genre-painter, landscape artist and art critic Gladys Moore MacCabe was born in County Antrim. Regularly completing the Royal Drawing Society examination during her teens, she attended the Belfast College of Art where she studied drawing, painting and fashion design, achieving the best all-round record upon graduation. In 1941, Gladys married Max MacCabe with whom she later held a joint exhibition in London's Kensington Gallery in 1949. Meanwhile, during the war she met numerous fellow Northern Ireland artists such as: George Campbell (1917-1979); William Conor (1881-1968); Gerard Dillon (1916-1971); Charles Lamb (1893-1965); Frank McKelvey (1895-1974); Colin Middleton (1910-1983); Daniel O'Neill (1920-1974); Markey Robinson (1918-1999); Kenneth Webb (b.1927) and Maurice C Wilks (1911-1984) among others. In addition to exhibiting her paintings, which continued to be based on her daily surroundings, her family and landscape, Gladys MacCabe also wrote an illustrated weekly fashion column for The Belfast Newsletter and also contributed to The Sunday Independent and RTE. In 1957, she founded The Ulster Society of Women Artists which still thrives. In 1980, Gladys was awarded an Honorary Master of Arts Degree from Queens University, Belfast, in recognition of her contribution to the arts. 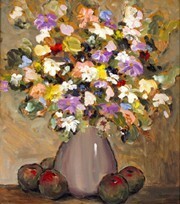 In 1989 a retrospective of her work was held at the George Gallery, Dublin. In 1993, she had another solo show at the Emer Gallery, Belfast. In 2000, she was awarded an M.B.E. for Services to the Arts. In addition, Gladys MacCabe was an honorary member of the Royal Institute of Oil Painters (ROI), the Royal Ulster Academy of Arts (RUA), and the Ulster Watercolour Society. She was also a fellow of the Royal Society of Arts and of the International Institute of Arts and Letters. Gladys MacCabe lives in Belfast, continues to paint regularly and is the art critic for The Ulster Tatler. Demand for her paintings is rising and her artworks are on show in several galleries throughout the North and South of Ireland, including Gormleys Fine Art. Sadly, Max - her husband of fifty-nine years - died in 2000. Her paintings are held in several public and private collections, including: the Arts Council of Northern Ireland; the Arts Council of Ireland; Ulster Museum, Belfast; National Self Portrait Collection, University of Limerick. The auction record for a work by Gladys MacCabe was set in 2005, when her genre painting, entitled The Merry-go-round, was sold at Ross's, Belfast, for £22,200.  For more about Northern Irish watercolourists like Gladys MacCabe, see: Irish Art Guide.  For more about flower painting, see: Homepage.